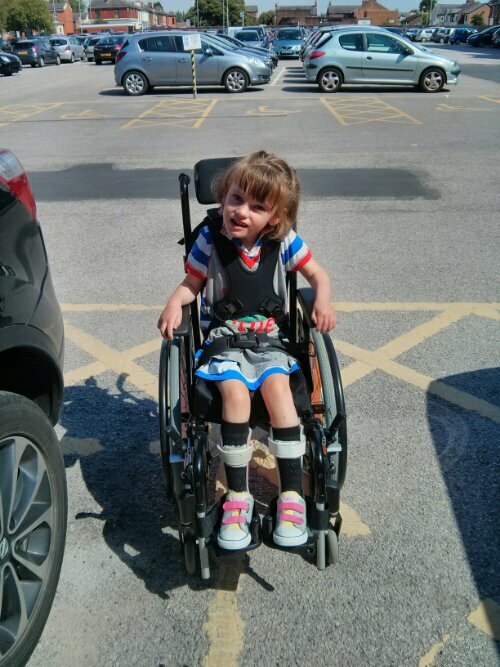 Yesterday we took delivery of Lilly’s first ever wheelchair which was a bittersweet moment. Up till now she has had a special needs buggy (which I hated) but her core strength has improved so much that a wheelchair is now suitable for her needs. She loves it. And I mean REALLY loves it. I showed her how to move it by pushing the wheels with her hands and Little Miss Tenacity has spent all of today practising and woe betide anyone who tried to help. She learnt how to move it within half an hour of me showing her but has stressed herself out. Her brain knows exactly what it wants to do but her little body won’t do as it’s told. I hate just having to sit back and watch her get upset and frustrated. She won’t accept any help, she is so fiercely independent. I feel helpless. She is watching some dancing on TV at the moment and keeps telling me about it. We had a little ‘chair dance’ along with it but then she started pointing at her feet and then at the dancers and saying ‘no’. Is she starting to realise that she has a disability? That she can’t use her body like the dancers on TV? I have been dreading this day…..
I’ve had a lot going on this week and that combined with Lilly not sleeping well for the last few nights has left me feeling a bit delicate and woolly-headed. I feel the need to reboot, so this weekend I shall immerse myself in my family and have some early nights. A snapshot from the wedding of the year. Uncle Andy is SO funny! New blog entry coming soon. So this week and next, Lilly is at a Holiday Club run by her school. It’s not cheap but it is wonderful. They have lots of trips out planned and today have been baking and painting. She has come home filthy, tired and happy. It gives me a few hours each day to pop in to the office and get some grown up stuff done and a little time to do the shopping but once these two weeks are up it will be much tougher. The thing is, Lilly has just turned six and is growing tall. She has put lots of weight on recently (yay!) but these two factors combined mean that moving and handling is becoming a real issue. Matt and I cope okay between us but if our parents are to look after Lilly for a day, I am constantly worried. Not only is she getting big and heavy but her recent cognitive developmental surge means that she requires a lot of stimulation and patience. She gets very frustrated now when her body won’t do what her brain wants or she can’t sound the words she needs to make herself heard. Needless to say this breaks my heart and I find it hard not to get upset along with her. Her school teachers are incredible and are experts in working with children like Lilly and because they aren’t emotionally attached can deal with it no problem but for me and my family, it can be heart wrenching. So yes, school holidays are a challenge. I’m lucky in that I work for my brother who is super flexible but what do other parents in my situation do? It’s not like we can book our children on to the local holiday club at the school down the road and as I’ve explained it’s not always possible, practical or safe for our parents or other family members to be able to step in either. I get frustrated that there aren’t more childcare facilities available for our children and also that the few that are available are miles away or not really appropriate. All that said, I can’t wait for a week on Monday when I have Lilly all to myself for a few weeks. We have a whole host of appointments to deal with; some standard ones, some I’m really not looking forward to but in between all the rough stuff I will be mainly playing with my girl. By playing I mean sneakily doing physiotherapy, occupational therapy, speech and language therapy and rebound therapy. I’m getting good at disguising it as fun these days. The thing I’m not so good at is knowing how hard to push her. When we hit the level of frustration do I back off or try and help her push through it? I’m pretty hard on myself as a parent. I lay in bed every night tormenting myself with the question, ‘Am I doing enough for Lilly?’ Will there ever come a point where I’ll just sit there with a satisfied grin on my face knowing that I did everything I could? Probably not because I’ll never stop reaching, pushing and fighting for my girl. It’s the hardest job I’ve ever had in my life and my boss is a six year old girl who is quite hard to please! The school holidays exacerbate all these feelings because we’re spending so much time in each others company but I am grateful for every single second of it. So yeah, surviving summer isn’t easy but then this gig was never going to be so I have a little wallow and then give myself a kick up the backside and get on with it. There’s a little girl sat on my knee who needs me. And I need her too. I’m Nicky. I’m 37 years old (just!) and am the proud mother of Lilly, my 6 year old daughter who has cerebral palsy affecting all four limbs and epilepsy. This blog will mainly be about special needs, parenting a child with special needs and its highs and lows. My aim is to keep it positive and compassionate but also reflective of what the dark times can be like. There will also be the odd horse related post so I apologise for that in advance but both Lilly and I are a bit horse mad so it’s inevitable I’m afraid! My intentions for this blog are honourable. I want it to be a place for other parents in my situation, who might sometimes feel alone in this special needs bubble, to find some solace and solidarity.